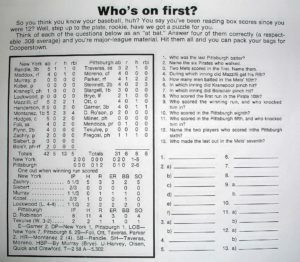 Question #5 – How many men batted in the Mets’ 10th? Answer – It’s really easier to answer this one after solving Question #6. Kranepool made the final out of the Mets’ 9th. Mazilli led off the 10th with a single. The bases were cleared when Henderson hit into a double play. Montanez followed with his 2nd HR of the game, a solo shot, which was the 2nd hit that Tekulve gave up in the inning. Hodges was retired for the final out. Four batters came to the plate, picking up a pair of hits, but only one run, as a result of the Pitcher’s Best Friend.